New Albany, Indiana may be small, but it has delivered a big punch in the music world. Jamey Abersold, born in 1939, hailing from New Albany, is considered the father of play-along improv jazz music books. His books are a staple in the realm of jazz and blues. Fast forward 75 years, and New Albany is making waves yet again in the music world- Enter Houndmouth. Houndmouth is a vintage-folk-rock-country hybrid band, and so original that it’s a disservice to try to pigeonhole them into even one of those categories. I was fortunate enough to see Houndmouth last November at the Vogue (a perfect venue in Indy, as far as I’m concerned), and they put on an energetic and memorable show for their home-state crowd. Their stage presence is humble and likable, seemingly fitting for a band full of Hoosiers. It’s a little unbelievable that the band has only been together for five years- they play with the intensity and maturity of having known each other for decades. Their sophomore album, Little Neon Limelight was just released in March 2015, and they have continued to expand their diverse repertoire. 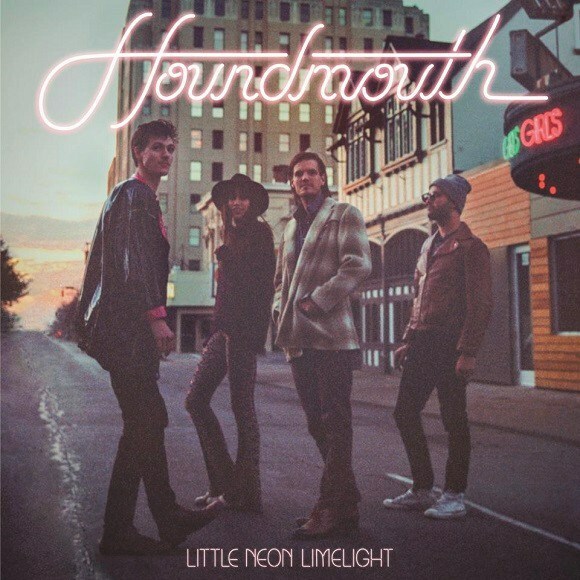 From the heartbreaking “Gasoline” (“I just wasn’t made for no diamonds or pearls/Gasoline, it don’t burn as fast as me”) to the hillbilly-garage rocker “15 Years,” Houndmouth effortlessly transitions styles while always maintaining their unique sound. Their bluesy ballads deliver sincerity in both the lyrics and the vocals, but when the beat starts to pick up, prepare yourself for a raucous, shout along-singing good time. Houndmouth’s four members split their duties between instruments and vocals- Matt Myers on guitar, Katie Toupin on keyboard, Zak Appleby on bass and Shane Cody on drums. Their vocal harmonies are gorgeous, but Toupin’s voice is something truly special. Her haunting, soulful voice is especially wonderful on “Otis” (about the death of Otis Redding). Show some love to the not-quite-Indy-but-close-enough-to-hometown Houndmouth. They will be returning to the circle city on Thursday May 28 at the Vogue, until then give Little Neon Limelight a listen. You’ll be proud to call Houndmouth fellow Hoosiers. Purchase Little Neon Limelight on iTunes now!